Hell Mutt Photopom is a time traveling dog. 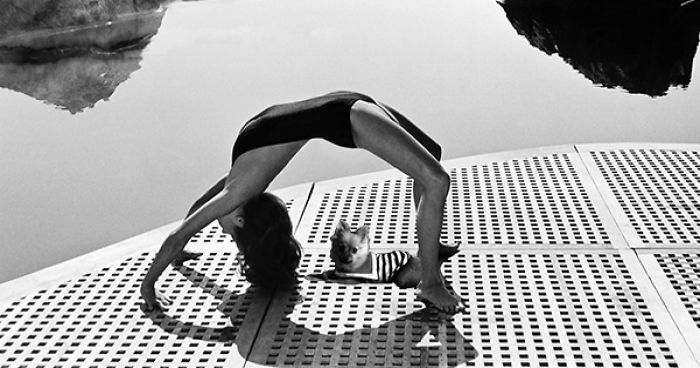 She photobombs current events, celebrities, athlete and movie scenes but she got her start with Helmut Newton photos. Each photoshop takes about 5 minutes to do. 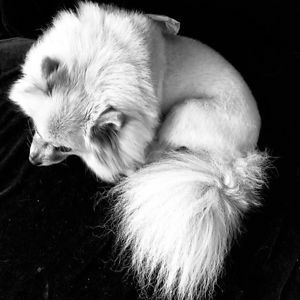 An image of Hell Mutt Photopom, the eight year old pomeranian, is rendered in black and white, she is cut out with the orthogonal lasso tool and pasted into a Helmut Newton photo. Her brightness and contrast are adjusted and then her furry edges are blurred and smudged into the background. She has gained over 20,000 followers on Instagram in her first 2 weeks on the platform. Follow her at @photopommed on Instagram and help her choose who will be next. Photopommed Helmut Newton – The Last Days of Salvador Dali – Hotel Meurice – Paris – 1973. Photopommed Helmut Newton – Fat Hand and Dollars – Monte Carlo – 1986. Hell Mutt Photopom is a time traveling dog. I photobomb current events, celebrities, athletes and movie scenes but I got her start with Helmut Newton photos. I have gained over 20,000 followers on Instagram in my first 2 weeks on the platform. Follow me at @photopommed on Instagram and help me choose who will be next.